My grandda McLaughlin was a seanachie. An Irish teller of tales. My earliest memories are listening to the music of his lyrical brogue spinning grand stories of kings and castles, battles and banishments, magic and miracles. Inheriting his love of storytelling, I wrote my first novella—a tragic romance about two star-crossed Mallard ducks—for a second grade writing assignment when I was seven-years-old. The story did NOT have a happily-ever-after romantic ending. After being shot by a hunter, the female duck died of lead poisoning. Unfortunately, she did not go quickly. It took several chapters for her to finally fly off to that heavenly wetlands in the sky, leaving the drake a grieving widower, forced to raise their baby ducklings alone. After receiving a gold star for my three-Kleenex Mallard romance, I immediately decided to become a writer when I grew up. The land of my ancestors, which has always felt like home, is one of unbridled spirit, whitewashed cottages, storybook castles, and ancient legends. One of the things I especially love about writing my Castlelough stories is borrowing from those Celtic legends while making up a few of my own. The Lady in Legends Lake, which Simon and Schuster has just re-released, is a blend of both legend and imagination. With a bit of Irish magic thrown in. I also love sharing my own family history, such as my grandda kidnapping—with her consent!—my grandmother, when her wealthier “lace curtain” Cavanaugh family wouldn’t permit them to marry. I gave that to Nora’s father in A Woman’s Heart, the first book in the series. Hardly a day goes by that I don’t think about the fact that by exploring my favorite themes of love, loyalty, family, and, of course, my favorite, redemption (and Alec MacKenna definitely feels in serious need of redemption), I’m following in Grandda’s footsteps. In all his tales, heroes and heroines ventured forth on quests against seemingly impossible odds, slaying myriad dragons along the way. Tyrants were toppled, lovers united, the wicked were punished, justice prevailed in the end, and the good always lived happily ever after. And isn’t that what romances are all about? To celebrate Legend’s Lake‘s re-release, five lucky readers who comment here or on my blog will receive a copy of the book, along with A Woman’s Heart. Winners will be chosen at random with entries limited to the U.S., Canada, Great Britain, Australia, and New Zealand. The contest will begin Friday, June 20th, and to give everyone a chance to enter, I’ll announce the winner on my blog and my website on Monday, June 30th. A special kind of heart . . . In the do-or-die world of horse racing, Alec MacKenna stands out as a man who genuinely cares—not just about winning, but for the horses he trains. And he knows that the rangy Irish Thoroughbred Legends Lake needs some special handling. The young stallion could be a Triple Crown contender, but he’s more intent on outrunning his demons than his competition. There’s only one hope for curing him: taking him back to Ireland and the unique woman who bred him. Kate O’Sullivan’s ability to soothe a frightened horse is almost magical, but the Irishwoman is also as stubborn as the day is long when it comes to all she holds dear. Since Alec has a temper himself, their new partnership promises to be fiery. But as their shared concern for the troubled horse brings them together, they find that sometimes a lot of heart is all you need to fall in love. . . . Thank you! I have another reprint next month, then a new Castlelough story next month. Series. Your books are always a great read! Corduroy7, Thanks for commenting and – yay! – random dot org chose you as a winner! 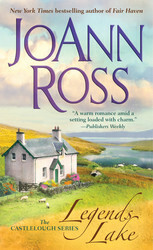 If you email your post office mailing address to JoAnn AT JoAnnRoss Dot Com, we’ll get your books sent out to you! Congratulations and have a great week! I would love to win this! Love your books! I love Irish story telling – I need to check out your trilogy.